All activity in the Catatumbo region of northeast Colombia was paralyzed on Sunday, as the war between the EPL and ELN guerrillas escalated and an armed strike was called. 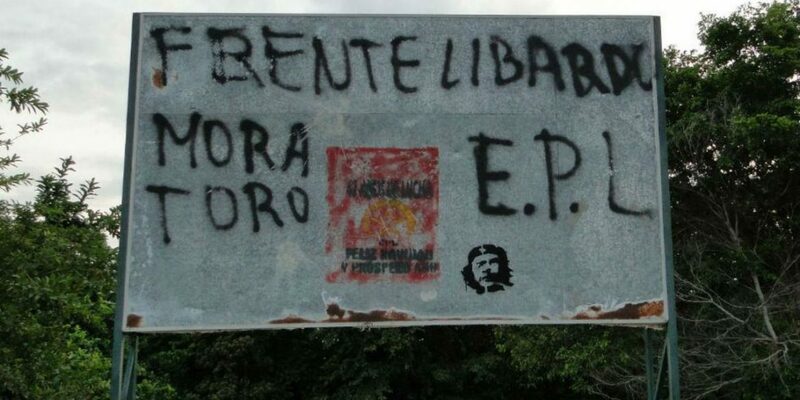 EPL dissidents known as “Los Pelusos” have been fighting for drug trafficking territory in the region since early March with Colombia’s largest active guerrilla group, the ELN. “Ignoring this warning we understand as your participation, complicity, and collaboration with the ELN,” the statement said about the armed strike. Authorities in the region rejected the seriousness of the EPL warning and said it was “intimidation in the face of a military power they don’t have,” said a police source to El Tiempo newspaper. Police Coronel George Quintero called the situation in the region “normal,” and that civilians did not have to close down shops or hide, and that they did so voluntarily. “While the police say that there is normality in the Catatumbo, the communities are confined and in total anguish, the ELN and EPL must respect international humanitarian law,” a local resident responded to the police reaction. The El Tiempo source also alleged that the EPL is trying to use the statement as a way to hide the fact they’re losing the war. “At this moment we know that the ELN has recovered territory in areas such as El Tarra, San Pablo and Convencion, which for some time were in the hands of ‘Los Pelusos’,” the source said. Locals nonetheless complied on Sunday, as community leaders reported a complete commercial and transportation paralysis, with streets empty in most towns in the region. The rival guerrillas responded by blocking roads with spraypainted “ELN” cars. Community leaders were also threatened to be killed by guerrillas. “The situation became critical since threats to community leaders are constant, including threats to assassinate them,” said a spokesperson for farmers in El Tarra. Violence between the EPL and ELN had escalated this past week as an unconfirmed number of deaths were reported in the region. According to the police, the two guerrilla groups are fighting for control of 16,000 hectares of coca, the key ingredient in cocaine production, and for laboratories and trafficking routes to Venezuela. The EPL formally demobilized in 1991, but a dissident faction remained active in the northeast of Colombia where it controls drug trafficking routes. Last year, the group reportedly made a request to the government to be included in Colombia’s ongoing peace process that has seen the country’s largest guerrilla group the FARC lay down weapons after more than 50 years.